24th September 2018, New Delhi: The Indian rupee recently touched a lifetime low against the US dollar. From around 67 per dollar a few months back, it touched 72.99 recently. While the fall in the rupee value is being called a temporary phenomenon, the government is already mulling applying import curbs on several non-essential items to control the outflow of dollars. This includes increasing the import duty on steel to 15% and putting curbs on import of gold and high-end electronics. 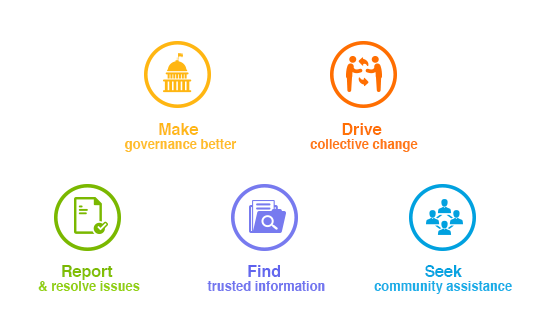 LocalCircles conducted a short survey to understand citizen views on the issues. The survey received close to 23,000 votes. 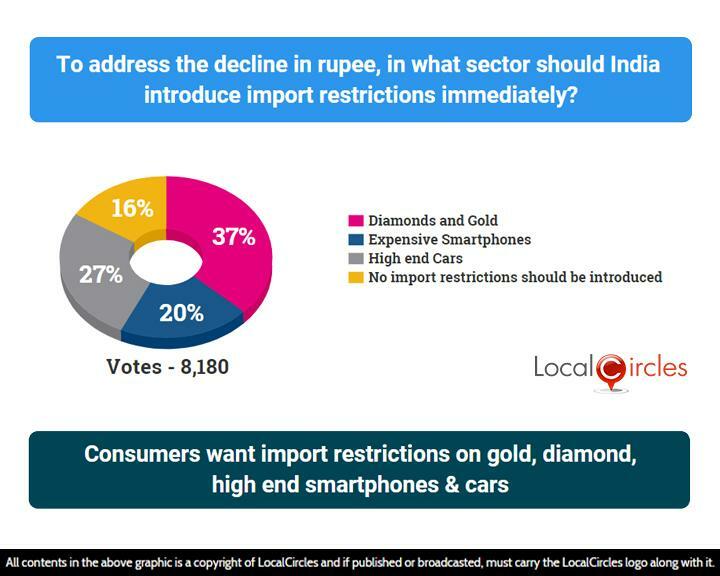 Citizens were asked in what sector should India introduce import restrictions immediately to address the decline in rupee. 37% said gold and diamonds and 20% said expensive smartphones. 27% said high-end cars while 16% said no import restrictions should be introduced. The second question asked what products according to you should India increase import duties on to address the decline of the rupee. 67% said gold & diamond and 9% said steel. 8% said thermal coal while 26% said electronics (smartphones, printers, laptops etc.). The current import duty on gold is 10%. 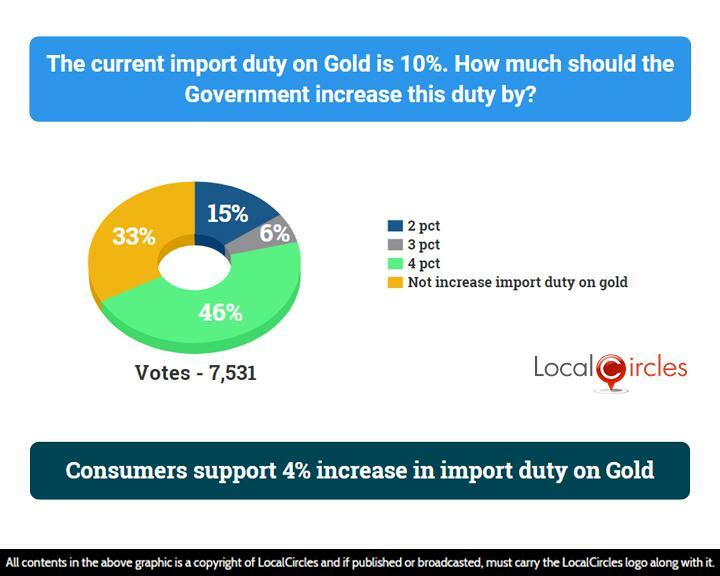 The final question asked how much the government should increase the duty on gold by. 46% suggested 4% and 6% said 3%. 15% said it should be increased by 15% while 33% were unsure about it. The demand for gold has already fallen this year when compared with last year and the World Gold Council has warned India against curbs on gold imports. Jewellery shares have also started losing value due to the fear of curbs being out on the import of gold in India. 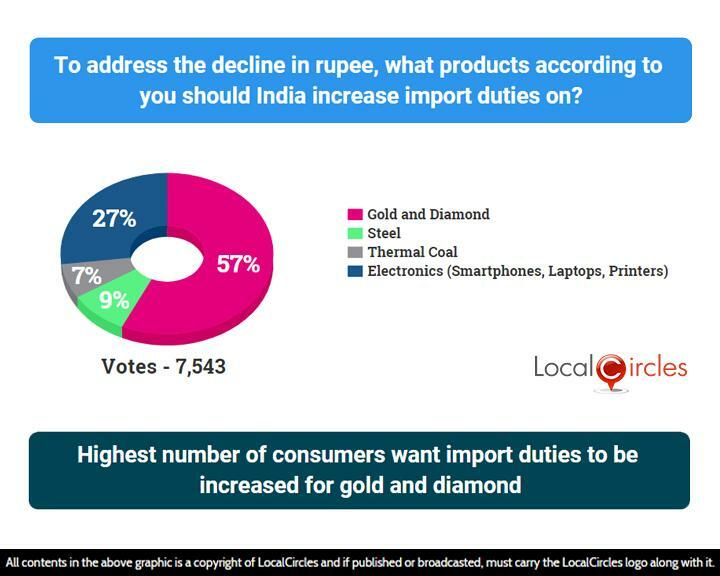 The results of the survey clearly show that citizens believe gold and diamond import segment is the one that should be targeted to make the rupee strong against the dollar. The Reserve Bank of India tried to calm the market by selling about $400 million to $500 million but that didn't work, showing the low confidence in the rupee. India is the world’s second-biggest gold buyer. Industry experts say that the import duty on gold should be increased by 2 to 3 percent which would fetch the government another $800 million to $1.2 billion roughly.